This article takes a deep dive into four different ways SVG can be used, and compares support for those methods across several of the most popular email applications. Let’s see where we get the most support. You might have noticed that I assigned classnames for each path. If you were hoping the CSS properties for SVG are also supported for those email clients that recognize inline SVG, well, you’re in luck. They are, across the board. Note that some email applications are known to strip CSS from the document <head>. In these cases, it is a best practice to inline our styles in addition to including them in the <head>. 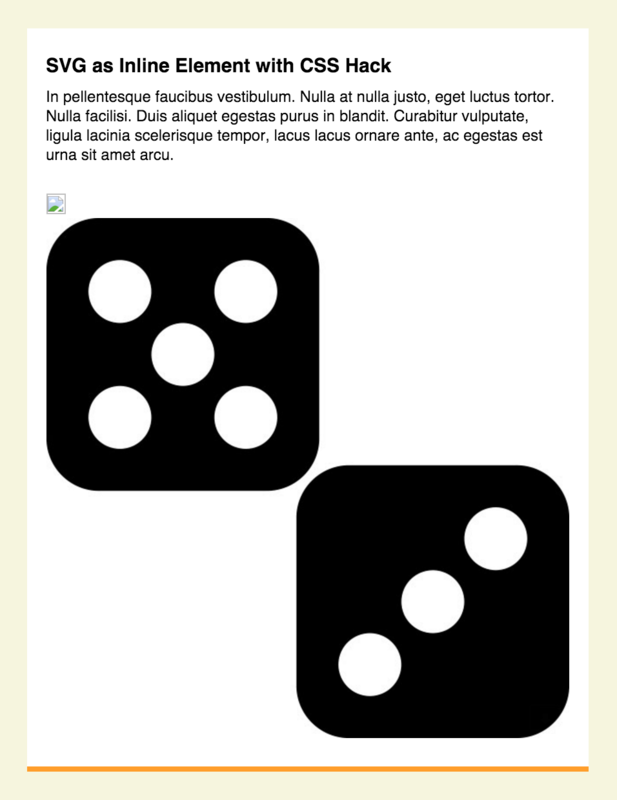 Also, CSS backgrounds are a bit unpredictable if we're dealing with a responsive design. Keeping the width and height proportional to each other would be tricky, and probably more hassle than it's worth. Update: The following hack was intended to exploit Gmail's lack of support for CSS contained in the document <head> but that is no longer the case as of September 2016. The support table at the end of the article has also been updated to reflect this change. The results here aren’t very encouraging. I mean, the the best support is 60% and that's kinda crappy. But, what if we tried combining a couple of different techniques to get something provides us better support? If we were to stay with this, we would have a situation where some email applications display two images and others display one with a broken image symbol. Yuck. So, so, so close! We have full support for many clients, a responsible fallback for another, and unfortunately no support in Gmail which is a significant slice of market share. ...is that email is still in the Wild West of front-end development. I would personally feel like using SVG is a gamble, particularly if it's known that your subscribers rely on Gmail. That said, knowing your audience is likely the determining factor for whether SVG can and should be used in email. For example, a developer of iOS apps who knows that customers consume email on an OSX or iOS device might feel really good about using SVG. Many email marketing providers (like MailChimp and Campaign Monitor) make this information easy to find with analytics. Campaign Monitor also has a pretty handy report on the popularity and market share of email applications that is worth checking out. For stand-alone email clients, I think a lot of it is just development resources not being there. For in-browser email, it’s a mix of performance, UX, and security concerns. In order to provide a fast and consistent UI for an entire email conversation, Gmail doesn’t create separate <iframe>s for each message, it just inserts the (modified) HTML into the main page. To avoid messing up the rest of the page, it therefore strips out all global styles and anything that could affect the overall page layout, or anything with security issues. Not sure why they don’t like an <img src="*.svg">, though. That has neither layout nor security issues (or at least, no more so than any other image type). SVG can call its own external resources, which can call their own external resources, etc. I can see where that might be a security concern, and nobody wants to be the next “Outlook attachments” poster child. For some reason, Microsoft decided to use the MS Word HTML rendering engine in Outlook 2007 to 2013 (desktop version) – this was even worse than the IE5/IE6 rendering engine which I believe was used in Outlook 2000, 2002 and 2003! As most large corporate businesses force their staff to use a version of desktop Outlook that hasn’t been updated in years, email is stuck in this hell of being held back in worse-than-IE6 web. Luckily now mobiles and webmail is prevailing which is bringing in these standards, and the likes of MS Office 365 subscriptions are replacing old and crusty versions of MS Office (and with it Outlook) in the workplace. So things are on the up. It’ll take a good few years to get there, but email will eventually catch up with the modern web. Great resource, even with the rather disappointing results for browser support. However, I’m worried about your fallback strategy. I’d assume that most email clients will end up downloading both image files. Since one of the key benefits of SVG is usually file size, I’m not sure how often there would be a benefit relative to using the raster (PNG/JPEG) fallback alone. The fallback has very nice support and where it didn’t work (a few outlying instances) it showed nothing rather than displaying the images twice. Did you happen to test base 64 encoded data URI’s? I remember once reading something about browser support being slightly different when using data URI SVG, not sure if it’s still relevant today or when used in an email client but might be interesting to check out as another CSS background solution. This post is relevant in terms of older browser support for SVG using data URI. Wonder if the same could be applied to email clients? Sure did! The results were surprisingly the same. I used a base 64 encoder on the web, it spit out some awful-looking code and turned up working as well as referencing the image file itself. As a technical research this is interesting. But “a developer of iOS apps who knows that customers consume email on an OSX or iOS device” misses “and is not using Gmail” so even this target group is hardly worth the effort IMHO. Email still is and probably will for time be a very stripped down version using very old tech. And as hard as it is to test properly I would recommend to use the simplest stuff possible which is known to work everywhere. Nice article, by the way, Geoff… Keep trying to love email – the challenge makes it fun (kinda). Oh nice! Totally forgot about the conditional statements as a means for targeting Outlook–nice addition! I just don’t get it why people keep pushing with technologies and E-Mails. So far there is not standard guiding anything in the email … Look here is how to create responsive emails … but it wont work on X and Y and Z … This is how to use video background in email … but it only works on X … Finally, SVG in emails wow! Until emails have a document that vendors follow I don’t think it worth wasting time with all that. Who would ever use that?! Nice support for inline SVG! Doesn’t native android (above 2.3) support SVG (or so I read)? Initially you have it as “no”, but at the end changed it to “yes”.